Nevertheless, the war is on, and there is a major battle taking place right now. It is the Battle of Standing Rock, and what is going on there deserves far more attention than what any candidate may or may not have said or done five or ten or twenty years ago. When I was a young boy, I lived for a while in Mobridge, South Dakota, just across the river from Standing Rock Reservation. The indigenous people of that area take their history seriously. I was living there when a dispute arose about where the remains of the Hunkpapa Lakota leader and philosopher Sitting Bull (Tatanka Iyotake) should rest. Sitting Bull had been buried at the reservation agency in Ft. Yates, North Dakota, but many in his family and other tribal members wanted his bones returned to the area of his birthplace and home near Mobridge. In the end, his great-nephew, along with other tribal members and local officials, arranged to sneak across the State line, dig up the remains, bring them back, and deposit them in what is now a memorial interment site. “The past is never dead,” wrote William Faulkner. “It isn’t even past.” The indigenous tribes of the Northern Plains – despite decades of attempts to wipe out their heritage – have held on to the remnants of their older way of life and its accompanying spiritualities. “Ancestor worship” might be too strong a term, but the honoring of ancestors and places both sacred and historic is a major feature of aboriginal custom. During the 250 years or so of the horse-buffalo cult that defined the life of the nomadic tribes of the Great Plains, a lack of permanent residence led to a sense of territorial commonality – that nature in general did not belong to individual people. Land was viewed as not much different from air, water, or sky in that it was not owned in the sense of property. Here’s what’s going on there. Last April, a group of Standing Rock Lakota began to gather near where the Missouri River meets the North/South Dakota border. They were protesting the beginning of construction of the Dakota Access Pipeline (DAP) a nearly four-billion-dollar project to bring oil from the Bakken Field of northwestern North Dakota to pipeline junctions in Illinois for transfer all over the country. Energy Transfer Partners, builders of the pipeline, promise at least 8,000 construction jobs and millions of dollars for local economies while providing energy independence for the nation. 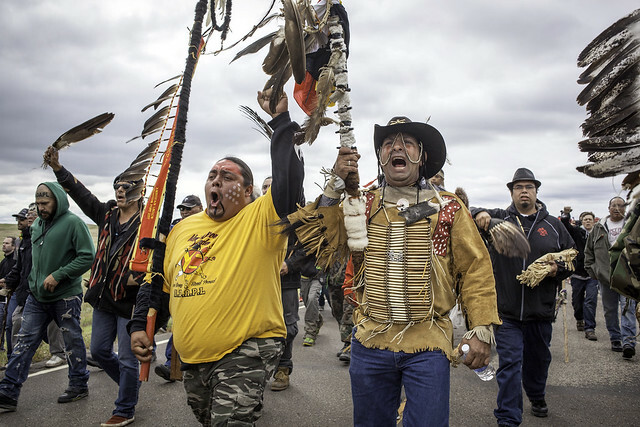 The tribes protesting contend that the project will disturb their historic hunting and burial grounds as well as threaten their source of water, since it will pass under the Missouri River, where a pipeline break would be catastrophic. The DPL construction site is not on reservation land, but on land of cultural significance to the indigenous people of the area. In a complaint filed in Federal court, the Standing Rock Sioux Tribe contends that construction of the pipeline “threatens the Tribe’s environmental and economic well-being, and would damage and destroy sites of great historic, religious, and cultural significance.” The tribe is represented by Earthjustice, a non-profit environmental law firm. The fight has now taken on significance beyond local concerns. Other groups and individuals from tribes across the nation as well as non-indigenous supporters have rallied to Standing Rock to protest both the pipeline and the tactics of the authorities who have pushed the protesters from one area to another, arrested protesters for trespassing on Army Corps of Engineers land (the tribes say the land is theirs under Nineteenth Century treaties), and used beanbag bullets, pepper spray, attack dogs, and noise generators against demonstrators. The area has taken on the appearance of a rural revival of the barricades of 1800s Paris, complete with burning tires and Molotov cocktails against military vehicles and helicopters. Meanwhile, the opponents of the DPL and supporters of the indigenous people have taken their fight to the United Nations, where the Permanent Forum on Indigenous Issues has declared that the United States government has not dealt in good faith with the Standing Rock tribe. Demonstrations in Washington, D.C., were sparked when a group of runners went there on foot from the protest site. Candidate Hillary Clinton has taken no stand on the DPL and has not made any comments about it. Where she stands on this vital issue is unknown, which is a cynical and cowardly position to take with so much in at stake in the broader issues. Candidate Donald Trump has invested somewhere between half a million and a million dollars in Energy Transfer Partners and a similar amount in Phillips 66 Co., which will hold a 25 percent interest in the completed pipeline. In addition, Trump has received over $100,000 in campaign contributions from ETP’s CEO. He has also repeatedly stated his desire to eliminate opposition to energy development. As I pointed out in my last post, environmental action – or lack of it – is the most pressing issue in this election, yet it is the least-talked about. The Battle of Standing Rock is a defining moment. It is the chance for activists and champions of environmental rights and human rights to make a stand. We owe it to ourselves as well as our descendants, to the present as well as the future, and to the world as well as the Standing Rock Tribe of Sioux to get involved. The first step is to find out just what the hell is going on there and see how it connects to everything else. I urge you to do so. Next Next post: TRUMP: IS THE OUTSIDER JUST MORE OF THE SAME?